Scan – see – think – act. ‘Fixating’ on something means not being able to take your attention (your eyes, for example) away from it. In the case of riding motorcycles, this leads to the phenomena wherein we tend to take our motorcycles in the direction we are looking. This is usually described with an example familiar to all — that if you see a pothole in the street ahead of you and don’t take your eyes off it, you are likely to hit it. Things actually get a lot more serious than hitting potholes when on the road. An oncoming truck, a crashed car, a fallen tree or a dog lying dead on the road could replace the pothole. Don’t look at the oncoming truck/tree/pothole; work out your escape route to the left or right of the danger and fixate on this path instead. In most cases, you can simply steer around it with little or no braking. Braking usually is and should be the last option. Accelerating and steering out of trouble is a lot easier. If you are following someone that you want to pass, don’t look at him. Look at that little piece of track that he has left open and go to it. When moving through traffic, don’t look at and fixate in the vehicles. Look at the gaps between them; imagine these gaps as pulsating spaces that keep changing shape according to the traffic. Ride through these spaces, searching out the next before you pass through the previous one. But use your peripheral vision to keep aware of the vehicle you are passing changing direction. Constantly scan the area around you, and continually provide yourself with escape routes. If something suddenly appears in front of you, simply look to your escape route, and counter-steer towards it. 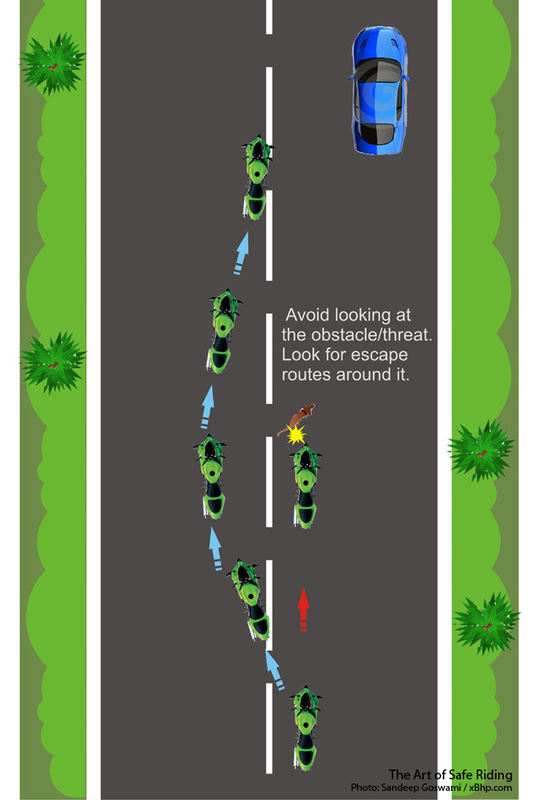 Photo: Avoid following other bikes at close gaps and always keep your eyes on the road ahead instead of getting fixated to the tail of the vehicle in front of you. You honk and flash at the car ahead and the driver promptly moves left, apparently making way for you. Don’t just rush past blindly. He could be moving left not for you but to avoid an obstacle.